You all know how much I loved my Daily Life Project, right? I've been thinking about what I'm going to do in 2015 for the last month or so. Since I loved scrapping the double pages each week I'm going to keep up with that goal but in different sort of style. 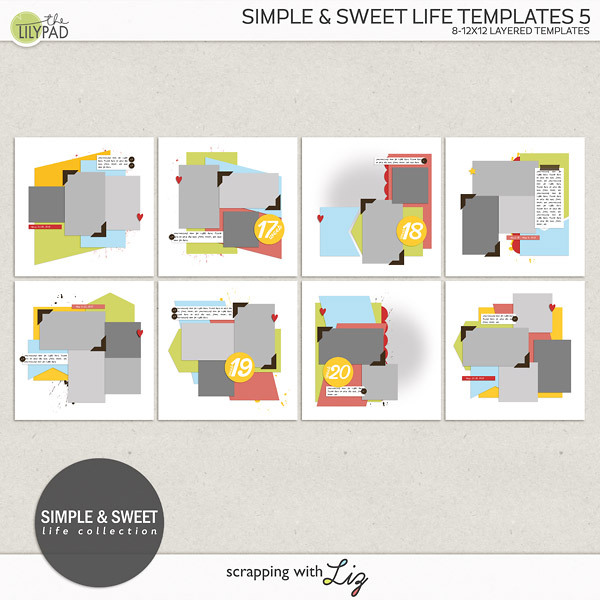 There were a few things I sort of wish I would have included on my Daily Life Templates: spots for little bits of journaling (instead of one big chunk), spots for all those pretty journal cards you see out there, more variety in photo size, and fuller filled pages. I think I've come up with the perfect style of templates for this project. 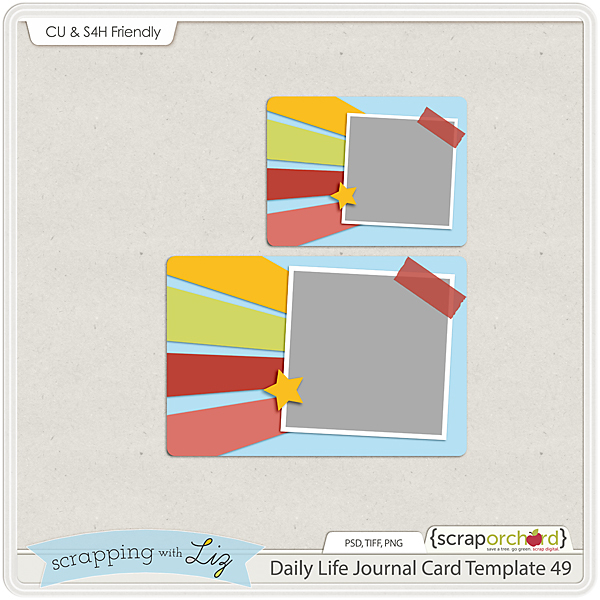 They are easy to use, hold variety of sizes for photos and journaling cards, and have little bits of journaling spots around the template. The first set will be releasing tomorrow. You can get a sneak peek here or above (see that top template?). How am I going to print this year, you ask? While I love photo albums, and that's what I plan to do with my Daily Life 2014 Album, this year I'm planning on trying something else out. Since my kids look at my albums a lot and it's been so hard waiting to order pages for a whole year, I've decided to go back to a more traditional approach. 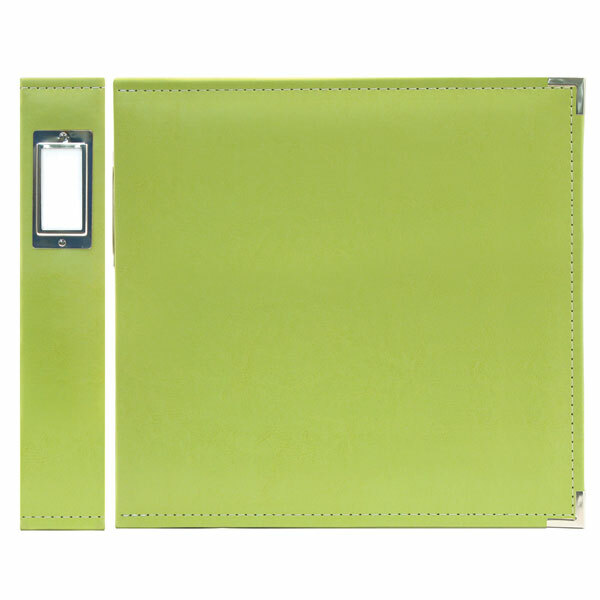 I purchased this Classic Leather Ring 12x12 Ring Album at Michaels. It's the We R Memory Keepers version, and I plan on printing my individual pages from Persnickety Prints and sliding them in the 12x12 page protectors. I think it will hold up to the wear and tear of kids. Plus I can order my pages throughout the year. The only downside to this is that it will take up a lot of space on my shelf, but I'll make room. I'm excited about this project because it's doable. I was able to keep up with my 2014 album, and I know I can keep up with this. Plus I'm excited that the style is going to be just a little different than last year. That's not all I have planned. Want to hear about my two other goals? Well, I'm going to tell you even if you don't want to....because I need someone to be accountable to. Then my final goal is to finish Matthew's Album. My goal is to scrap 2 pages a week until his album is done. This is the one that might be challenging....but I'm going to try. He needs an album on the shelf. 1. 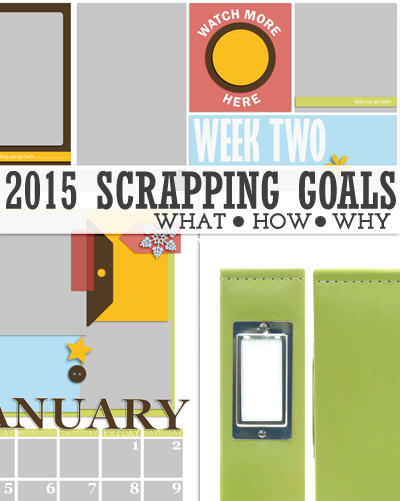 Scrap a double page each week of 2015. 2. 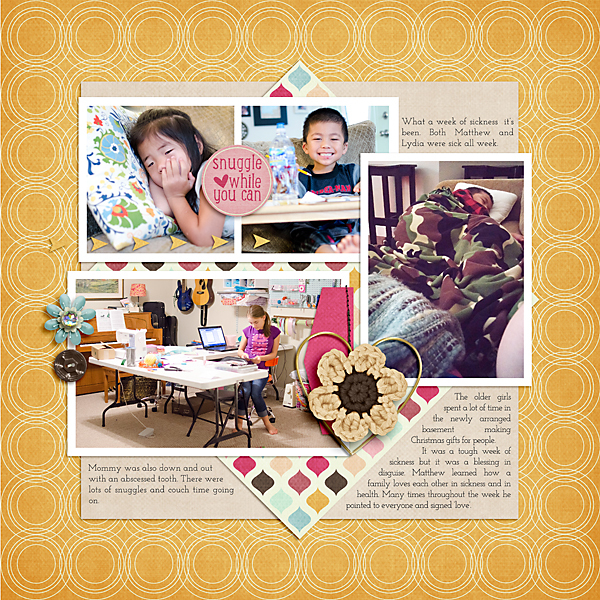 Scrap a calendar page each month. 1. Set aside a specific time to scrap every week. Probably Saturday night. I think I can accomplish 4-5 pages during that time. 2. Have my kit and templates ready ahead of time. 3. Turn of the internet. 1. It keeps my sane. 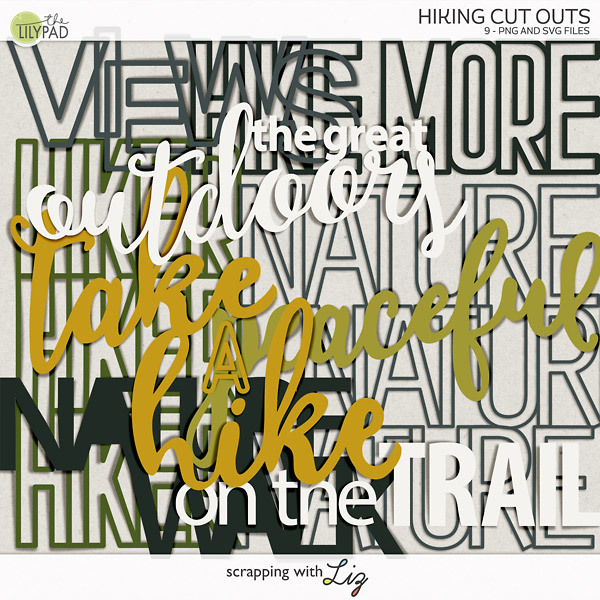 Scrapping is my down time. 2. My kids need the albums. 3. Do I need any other reasons? Let's do this thing. Who's with me? P.S. I'll be sharing my pages each week with you again. Merry Christmas from my family to yours! My sister tried to get a family picture for us...but let's just say Mommy was making a funky face and Daddy was closing his eyes. No fault of my sisters. I'm all to blame. 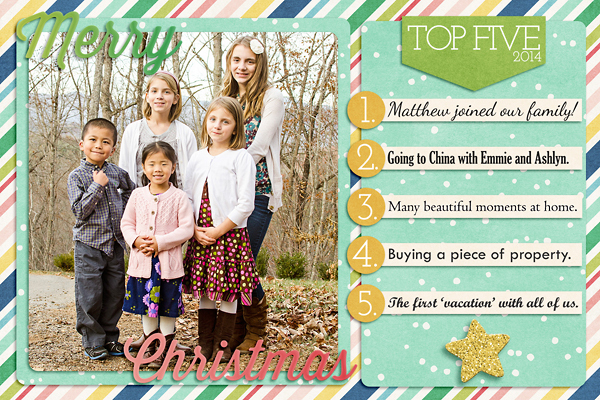 ;) But I'm happy to have this picture of all my children and just a few highlights of our year on this card. I just wanted to really wish you all a Merry Christmas and a Happy New Year! I know I've said it before but you guys are such a blessing to my family. I can't imagine my life without this little business and way of memory keeping. So, have a wonderful day. Take lots of pictures. Enjoy your family. Scrap lots of pages! I am so glad week 50 is over! We had a rough week around here. Lots of sickness. But it's okay because we had some good moments as well...and it's a brand new week and everyone is on the mend. 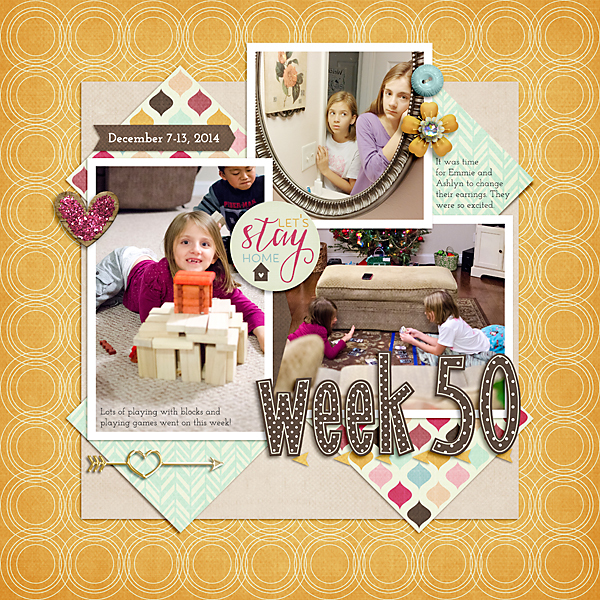 So, read more about our week below and make sure you grab the free journal card. Journaling: What a week of sickness it’s been. Both Matthew and Lydia were sick all week. Mommy was also down and out with an abscessed tooth. There were lots of snuggles and couch time going on. The older girls spent a lot of time in the newly arranged basement making Christmas gifts for people. It was a tough week of sickness but it was a blessing in disguise. Matthew learned how a family loves each other in sickness and in health. Many times throughout the week he pointed to everyone and signed ‘love’. Journaling: It was time for Emmie and Ashlyn to change their earrings. They were so excited. Lots of playing with blocks and playing games went on this week! 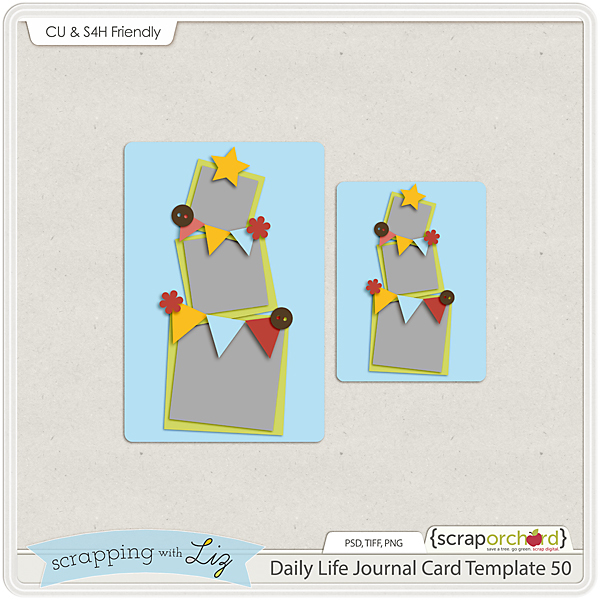 And here's your journal card freebie! Do you think it looks like a Christmas tree? I hope you all had fun shopping during my 50% off sale. Thank you all so much for being wonderful customers! 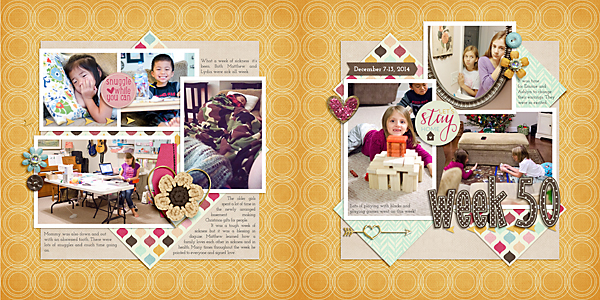 It's beginning to look a lot like Christmas around here and so are my scrapbook pages. I'm lovin' it. As the anticipation builds around her for Christmas Day my anticipation for finishing, ordering and receiving my 2014 Daily Life Album is also growing. Eeeek! 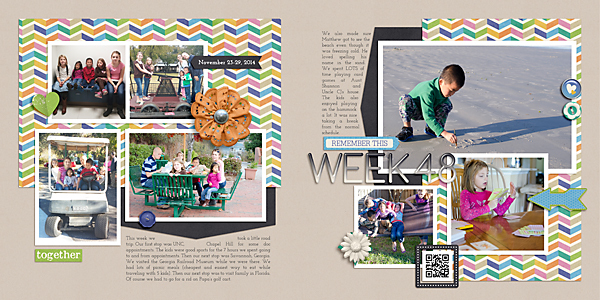 You can take a closer look at our week below and make sure to grab the free journal card template while you are at it. 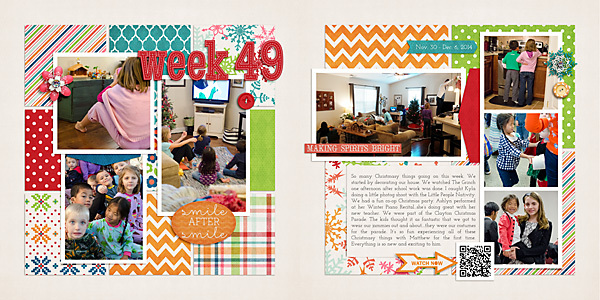 Journaling: So many Christmassy things going on this week. We started by decorating our house. We watched The Grinch one afternoon after school work was done. I caught Kyla doing a little photog shoot with the Little People Nativity. We had a fun co-op Christmas party. Ashlyn performed at her Winter Piano Recital...she’s doing great with her new teacher. We were part of the Clayton Christmas Parade. The kids thought it as fantastic that we got to wear our jammies out and about....they were our costumes for the parade. It’s so fun experiencing all of these Christmassy things with Matthew for the first time. Everything is so new and exciting to him. I'm almost there, to the moment we first met Matthew. I think once I get to scrapping those photos I won't want to stop. 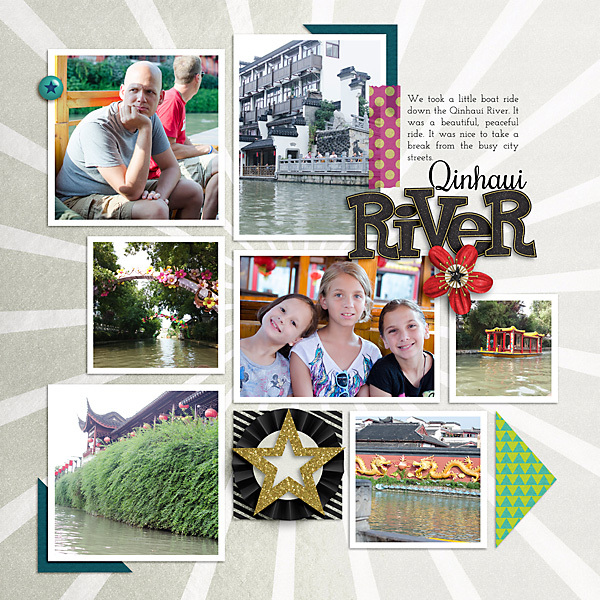 These are my most recently scrapped pages of our trip to China to bring Matthew home. We took a boat ride the night before we were to meet Matthew. I think the look on Shawn's face says it all. It's hard to enjoy such an amazing moment when all you can think about is the son you are about to meet. And this last page are of photos taken just hours before we met Matthew. All of them (except one) were taken with our phones. Can you tell which one is the DSLR photo? Even though the pictures aren't that great I still wanted to capture and remember these moments. Hopefully it won't be too long before I share my next batch of pages...and Matthew will be in them! Daily Life Week 48: Road Trip! Week 48 was a whirlwind, and looking through my pictures at the end of the week proved it. We went on a road trip which included everything from doc appointments, beach time, picnic lunches, visiting family, 4 states, over 30 hours in the van and LOTS of card games. It was hard picking out the pictures that I wanted to highlight on my Week 48 page and while I wanted to include at least 5 more pictures I'm happy with the end result and I think it shows a good picture of what went on. You can read more about it below. 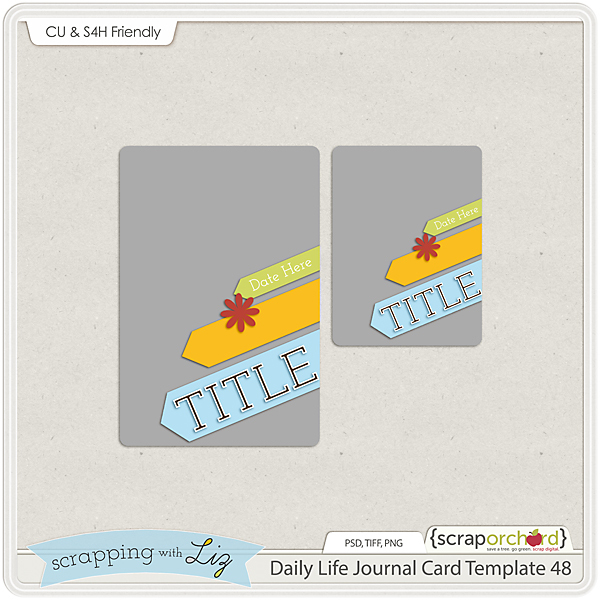 Make sure you grab the free journal card template this week too. 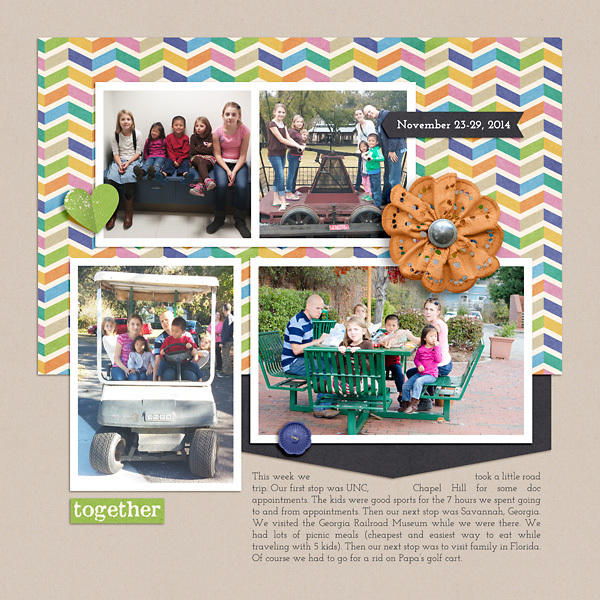 Journaling: This week we took a little road trip. Our first stop was UNC, Chapel Hill for some doc appointments. The kids were good sports for the 7 hours we spent going to and from appointments. Then our next stop was Savannah, Georgia. We visited the Georgia Railroad Museum while we were there. We had lots of picnic meals (cheapest and easiest way to eat while traveling with 5 kids). Then our next stop was to visit family in Florida. Of course we had to go for a ride on Papa’s golf cart. Journaling: We also made sure Matthew got to see the beach even though it was freezing cold. He loved spelling his name in the sand. We spent LOTS of time playing card games at Aunt Shannon and Uncle CJ’s house. The kids also enjoyed playing on the hammock a lot. It was nice taking a break from the normal schedule. And here's your journal card template. Can you believe we only have 4 more weeks of this project?! ?